So I kicked off the day with a nice run and she is now getting up. Looking forward to a great day! Looks like this week is creeping back up in temperature. This morning was humid and tough running. 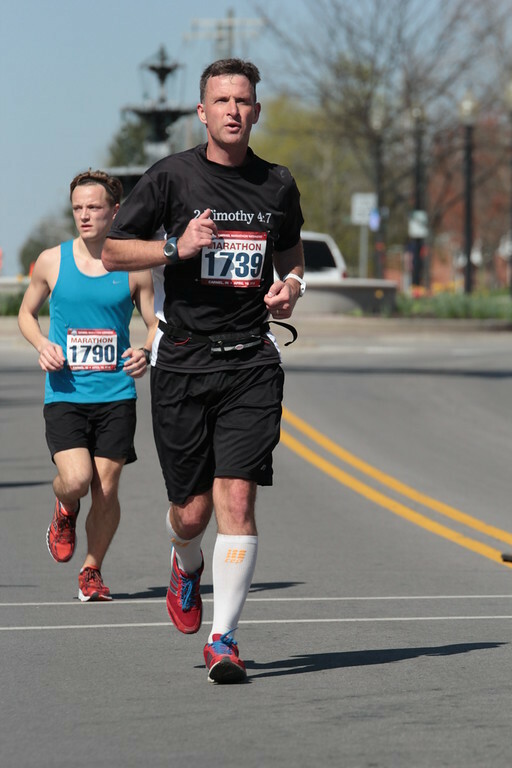 I kept my normal base pace and felt good overall, but it made me earn it that is for sure. Today was nice since I was able to try my first pair of Brooks Launch shoes. They have a new black color that look pretty cool. Of course, that all means nothing in a week at the pace we wear on these things. My Kinvara's have taken a beating too and do not get me started on my Wave Riders :) For the first day I will give my shoes a solid 'B'. No final judgment until I have run some more in them. Off to work as the kids go 'back to school' shopping! All I seem to start with is the weather, but I'm telling you the humidity is killing me!!!!!!!! Draining... but all is well now, and there looks to be relief on the horizon. It was funny, it was the 2nd day in a row that I was hoping to find someone outside watering their plants so I could ask to use the hose! I double back from my usual route to make sure I could get some liquid in me so that did help. Did not push too hard today nor will I tomorrow since I hope to make the 15K on Saturday. I decided to run the local 10K this morning. I did not really prepare specifically for it - just thought I would add it in. I did okay I suppose. I could have set my PR for a 5K today gauging on how strong I felt, however I seemed to slow down a bit over the last 2 miles. Odd how my training is much further but of course I am not pushing that hard. Ran a recovery run in the evening to add some more miles to my day and felt pretty good. I know the blog is for me to help keep me honest in my training and that is great (and important, I know no one on this blog so no one is checking), but I kept thinking I should have done better in the race. It let's doubt creep in. Boston has become a real goal for me and I want to make sure I prepare right. Maybe it is time to add some speed work back in now that I feel fairly comfortable with my base miles. I do not usually run on Sunday, but I wanted some quiet time with God and thought another recovery run would be a good idea. I also will be traveling a little next weekend so if I have to miss a day I would like to have my weekly miles all in. Humidity was back... blah... I wanted to do a little speed work so I did an easy tempo (i call it that at least) run today. Humid. That does not describe it. How about wet. No, no... hummm I do not have a good word, but within the 1st 10th of a mile I was sweating like crazy. Another 'Extreme Heat Advisory'. I would thank the weather channel for letting me know this. Today was bad though. In other news.. Overall 9 hot and slowish miles and happy to be in the a/c. I think I will go on a bike ride this evening. You know... being a runner adds some bulk to my packing! Back home so things getting back to normal. Nice weather this morning for running :) Angel met me about half way on her bike and had some wonderful water! You have to love that! My friend Cassie is hounding me (in a good way) to run some 5K's... like 4 in the next 3 weeks... not gonna do them all, but maybe 2. I think I will start calling my Tuesday's - Temp Tuesday's. Okay, not very creative. That being said had a wonderful tempo run today. I laugh at myself because I never really know what my 'fast miles' are. Sometimes if I am not racing I think everything is 'slow'. I warmed up at my normal base pace for 15 minutes, sped up for the next 15, and the 20 after that was a little faster than my goal marathon pace... I slowed for a bit, but since I had energy to spare I ran the last mile+ around my 10K pace. I read to much me thinks. There are so many books and articles that say do this or that. So far the advice on these blogs and website have helped more than anything before so I believe I will stick to that! After that was much training of others at work and then I was teaching our youth at church tonight. So all in all a productive day, but a bit tiring. Off to read some more (Once a Runner) and then to bed! Good fresh morning, run felt very good, I think those pm miles help. I am still debating on a race (5K) tomorrow or piling on a much longer run. I know I can run post race as well. I guess I will see how work goes. So after 9 miles 'Devil Dan' (Bon that is for you if you are reading today) said... 'you're not done are you? Letting your mind get the best of you...tisk tisk'... so I ran a little more and did some quick strides 6x200. After that I was ready to punch myself for the abuse of running those on tired legs. I know it was good for me to teach my body to run fast when tired, but I certainly was not thinking that during them! Nice and cool morning. Decent run after yesterday. Decided to race a 5K Saturday so I will run 'slower' the next few and see if I cannot set a new PR. AM- 9 vEZ miles. Plan on that 5K in the AM tomorrow so I did not want to skip on aerobic base yet wanted a little rest so hopefully that translates into a good time for me. If not I will just keep working! Good race this morning :) Nice weather and decent crowd. 3 of my friends/co-workers raced as well and that always makes for a better day. The race went well, I think I started a bit quick, but did not bonk so that was good. I dropped my pace slightly on that last mile and so I did not break 20, but set my PR so I was pretty happy with that! Rode the bike with Aly for about 3 miles tonight, and that was enjoyable for tonight. Big day tomorrow as I have the entire service! Nice Monday morning run. It was 90 yesterday and suppose to be so for this week.. blah. I run early so it is cooler, but still... it makes my desire to move to Alaska that much stronger. Anyway, good base run to start off the work week. Good morning, maybe a tad on the humid side, but good. More than the usual number of people out today, some new power walkers I saw - outside the usual people I might see in the neighborhood. Some good base miles with 6x30s@6:15ish after 5 miles. Off to work... someone out there has to want to work for me today!